At Chabad, 1827 Ponce de Leon Blvd, Coral Gables. Complimentary admission for ONLINE reservations by May 14, $10 at the door. The Temple Mount is one of the most important religious sites in the world and is the focal point for three major religions. It is the holiest site in Judaism in which direction Jews have prayed towards for centuries. What makes this place so unique? Why is it the most contested piece of real estate on earth? Come discover the based on archaeological discoveries that have been exposed in recent years. Learn secrets of the Western Wall, and marvel at the ancient construction methods used over 2000 years ago. Join us as we reconstruct the glorious edifice that once stood upon the Temple Mount - the place where heaven meets earth. Rabbi Stolik (a.k.a. Jewish Indiana Jones) has lectured on the topic of biblical archaeology in dozens of communities throughout the US and beyond. 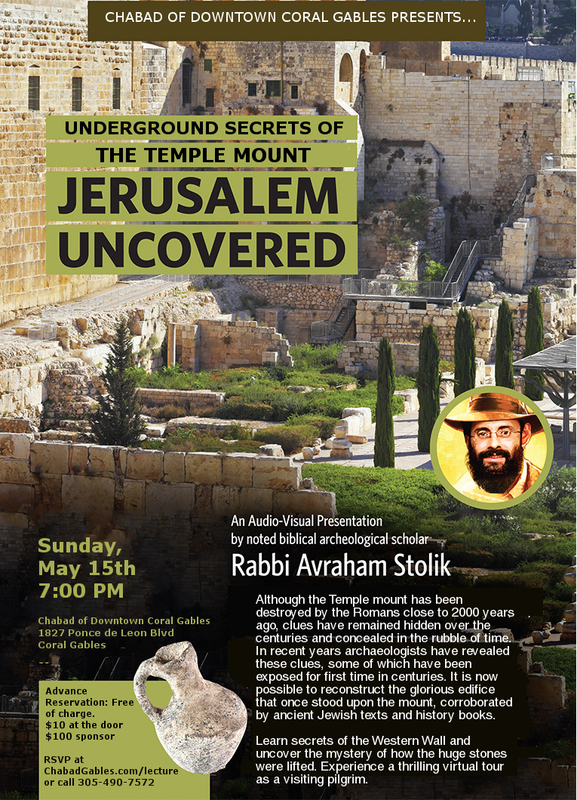 Visit Rabbi Stolik's website at www.JerusalemUncovered.com. INHERITANCE IS POISON: Save Your Family! It's Okay to Laugh, Seriously! Can Spirituality Affect your Health?